Cisco SFP+ Modules or 3rd Party SFP+ Modules, Which Is Better? In order to cater to the development of interface technology, SFP+ module has been introduced to provide a perfect solution with high port density and low cost. SFP+ module is an upgrade version of SFP module which stands for a small form-factor pluggable module. There are many different brands of SFP+ on the market, such as Cisco, HP, Juniper, Brocade, FS, etc.. Among these brands, Cisco is favored by most people. However, with the rising of 3rd party vendors, modules produced by the 3rd party have gone popular with their lower price and good quality. But the doubts and praises around them have never stopped. This article will help you compare all aspects of the products and help to choose Cisco SFP+ modules or 3rd party SFP+ modules. 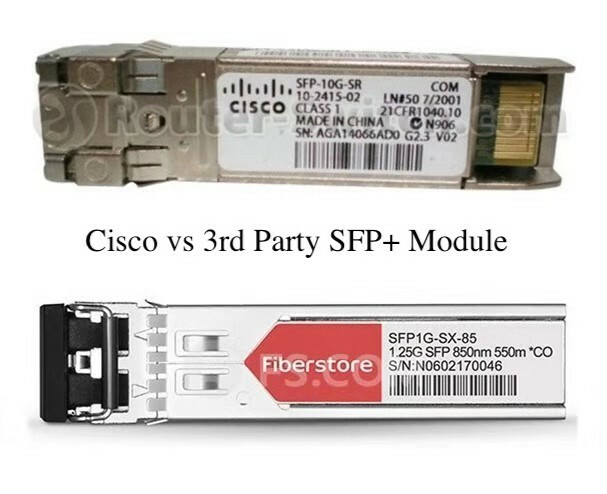 Cisco or 3rd Party SFP+ Modules: What’s the Difference? As we know, Cisco provides reliable SFP+ modules, while 3rd party also offers various SFP+ modules. So what’s the difference between them? The biggest difference between Cisco SFP+ modules or 3rd party SFP+ modules is the manufacturer. In fact, there are only a few qualified manufacturers. They supply all the raw components for all the transceivers on the market. To be honest, Cisco does not produce its own SFP+ modules or SFP fibers. Cisco is known to purchase optical transceivers from its suppliers who code and label for Cisco and then sell the transceivers to consumers. In this way, most 3rd party compatible modules are built and assembled in the same factory as Cisco. Above all, SFP+ modules are produced according to strict standards of MSA (Multi-Source Agreement), which determines the performance of the modules. Therefore, 3rd party SFP+ modules can be as good as Cisco SFP+ modules. The compatibility of SFP+ modules is controlled by OEM software codes embedded in the transceiver. Cisco SFP+ modules are not encouraged to use in other brands equipment because codes from different vendors might be unmatched. However, a good 3rd party vendor can make multi-coded compatible transceivers that can support different equipment. Taking FS.COM as an example, FS.COM provides a range of SFP+ transceivers that compatible with the mainstream brands on the market, such as Cisco, HP, Juniper, Brocade, Dell, Extreme, H3C, Arista, Huawei, Intel, IBM etc.. The compatibility and durability of the modules are strictly tested and controlled to ensure product reliability. So there is no need to worry that the 3rd party modules you bought will be incompatible with your devices. As we know that the data center often accommodates tens of thousands of devices. With your network system grows, it’s hard to connect SFP+ modules from different vendors. In this case, the function of 3rd party vendors reveals. 3rd party vendors can provide various compatible SFP+ modules to satisfy all your needs. Whereas Cisco SFP+ modules are not encouraged to use in other brands, even some of its own Cisco switches. Because different Cisco switches have distinct requirements for codes and hardware, you have to buy the specific one. In this case, Cisco modules are not that supportive for your future demands. It’s not surprising that Cisco SFP+ modules have a higher price over 3rd party SFP+ modules. Take a 10GBASE-SR SFP+ for example, a Cisco 10GBASE-SR SFP+ sells for $691, but a 3rd party vendor FS.COM sells the same product just for $16. Unbelievable, right? It’s not reasonable for consumers to pay extra money just for a brand logo. Why Are Cisco SFP+ Modules More Expensive? If the SFP+ modules are the same, why is a Cisco SFP+ module more expensive than a 3rd party one? There are two main reasons for that. The first reason is that Cisco claims that it has a higher quality than others and it has tested every SFP+ module to ensure the performance. But actually many transceiver manufacturers can do the test now. The other reason is the brand effect. It takes a cost to build a brand, but the benefits brought by the brand is also obvious. Cisco is a large equipment manufacturer with its own unique brand advantages, known by a number of consumers. It makes sense that Cisco has higher product prices. Is the Quality of 3rd Party Guaranteed? Certainly. The optical transceiver module is standardized by SFP MSA, which means there is no big difference between Cisco and 3rd party optical transceivers due to the same rules and standards. In addition, if the equipment is defective, the supplier is obliged to fulfill the warranty. The 3rd party has a comprehensive warranty policy to provide technical support and protection to consumers. Although Cisco claims that adding 3rd party modules does not void the warranty unless problems are caused by 3rd party modules. In general, it’s unlikely that SFP+ modules will induce damages to the slot itself. The statement sounds more like a self-interest protection. Excellent 3rd party vendors have proved themselves with good quality and reputation over the years. If you have found a reliable 3rd party vendor, choosing between high price Cisco SFP+ modules and cost-effective 3rd party SFP+ modules is not difficult. FS.COM is a professional optical transceiver manufacturer that provides a full selection of major brands’ compatible transceiver modules with strict tests and high quality. Along with the support of large inventory and efficient delivery, FS.COM can certainly meet the needs of your network. SFP-10G-SR-S vs SFP-10G-SR, Why Choose One Over the Other? OEM Optics vs Third-Party Transceivers: Which to Choose? This entry was posted in SFP+ transceiver and tagged 3rd party SFP+ module, Cisco SFP Modules on December 1, 2018 by Admin.